It’s been a while, but it’s time to discuss special teams again. 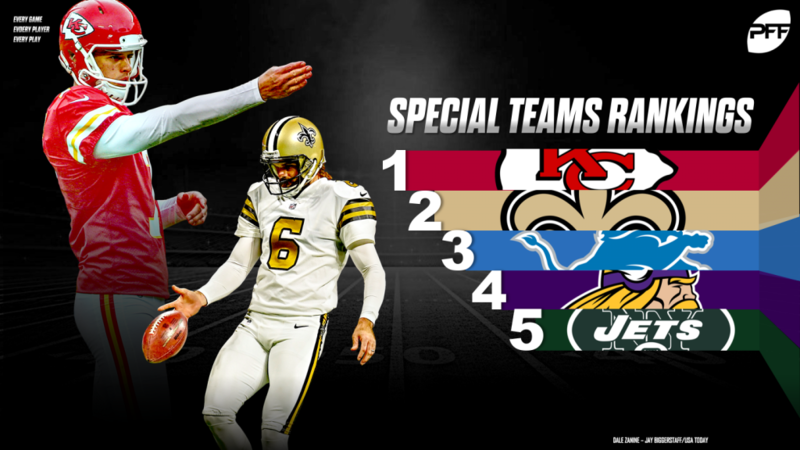 It should go without saying, but special teams are a non-trivial aspect of the game of football, capable of elevating marginal teams into playoff contenders and separating contending teams via field position and the conversion of opportunities into points. There is even a Kaggle competition currently running on NFL special teams, showing how interesting this “one third” of the game is to the data-inclined this time of year. At PPF, we grade every player on every play of each game, and special teams is no exception. Using machine learning, we can tie grades (e.g., process-driven evaluation) to team success and weigh facets of special teams properly (a task Rick Gosselin of the Dallas Morning News doesn’t do in his admittingly inspirational ranking system). Here are final rankings for the 2018 regular season, with write-ups on each of the playoff teams. The one seed in the AFC and a perennially good special teams unit led by head-coaching candidate Dave Toub, the Chiefs found some more gems this season, with PFF second-team All-Pro Tremon Smith, who was third in total return yards with 886. The second one seed to show up here, and while their offense didn’t ask Thomas Morstead to punt very often, he did so well enough to edge out Johnny Hekker and rookie sensation Michael Dickson for our first-team All-Pro honors. Aside from one of the league’s easiest schedules, one reason the Texans were able to manage an 11-5 season despite some metrics not indicative of such was their special teams. Ka’imi Fairbairn was very good on field goals this season, drilling 88.1% of them, including 66.7% beyond 50 yards. Sebastian Janikowski’s tackling notwithstanding, the Seattle Seahawks were very good on special teams in 2018, in large part due to outstanding play from All-Rookie performer Michael Dickson and star receiver Tyler Lockett, the latter of whom averaged almost 26 yards per kickoff return, with a long of 84. He gets older, and we all stay the same age (or something like that). The ageless Adam Vinatieri missed only four field goals all year and was 4/6 on field goals over 50 yards. The Chargers finally settled on a good kicker in Michael Badgley, who missed only two kicks all year. In addition, Desmond King II added to his All-Pro status as a slot cornerback by averaging 13.8 yards per punt return and turning around their Sunday Night Football game in Pittsburgh. This is pretty low for the Rams, but it was an odd year for them, having to cycle through Sam Ficken (1/1 on field goals) and Cairo Santos (1/3) during the five games Greg Zuerlein was unable to play. In addition, there was the curious release of Pharoh Cooper (21.3 yards per kickoff return) after his return from injury. He was the best return man in the NFL a season ago. This is a bit low for the Patriots, but the acquisition of Cordarrelle Patterson (26.8 yards per kickoff return, including a touchdown) was offset by poor coverage and a punter grading out as the league’s 24th-best. Cody Parkey has been something of an enigma this season, missing seven field goals and three extra points. This offset the brilliant play by Tarik Cohen (first in the NFL in WAR by RB), who led the league in punt return yardage with 411. This is uncharted territory for the Ravens, who lost a game this season because of a missed extra point by kicker Justin Tucker – the first missed extra point of his career. They also only averaged 22.1 yards per kickoff return this season. A top team in this rating system a year ago, the Cowboys have fallen a bit. Brett Maher has a huge leg but missed seven field goals this season, while the return men averaged under six yards per punt return and 22 yards per kickoff return. After seasons of being a top special teams unit, the Eagles are near the bottom of the league this year, and in many ways due to injuries in their coverage units and to their best return man in Darren Sproles. Their new punter, Cameron Johnston, has struggled, earning only the 34th-best grade at his position group.